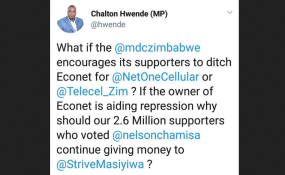 Business mogul and Econet Wireless founder, Strive Masiyiwa's call for the removal of economic sanctions imposed on Zimbabwe by the west has excited government with the Ministry of Information, Publicity and Broadcasting Services taking to Twitter to celebrate the 'timely' gesture. Speaking during an interview with CNBC Africa television channel, Masiyiwa described the political change in Zimbabwe as real. "l have invested in Zimbabwe in the last ten years a US$1.5 billion and l am committed to invest in Zimbabwe as l have always been come rain come shine. "Concerning the change that has taken place, l believe it is real, l believe President Mnangagwa is sincere in the things he wants to do. "It is going to be extremely challenging, anyone who understands economics knows that its going to be tough so l think Zimbabwe needs to be given a chance the day they will stop politicking and focus on rebuilding this country," said Masiyiwa. He called for the removal of sanctions saying the measures are not justified anymore. "l think the sanctions should be removed because there is no justification for them anymore, l have always been on record to say the sanctions are not justified," he said. Responding to Masiyiwa's statement, Ministry of Information, Publicity and Broadcasting said the country requires all the support it can get to create an environment that is conducive for the revitalization of the economy. "Government welcomes statements by @StriveMasiyiwa calling for the removal of sanctions imposed against the country. The country requires all the support it can get to create an environment that is conducive for the revitalisation of the economy #TSP #MiddleIncomeEconomy2030," posted government through the Ministry of Information Twitter handle. Renowned businessmen Dr. Shingi Munyeza and Trevor Ncube have since hailed Masiyiwa's remarks. "ZIMBABWE HAS TO BE GIVEN A CHANCE 1. The change that has happened is real. 2. ED is sincere in what he wants to do but it's gonna be extremely challenging 3. We got to stop politicking and focus on rebuilding this country. 3. Sanctions must be removed," said Munyeza. "I am absolutely delighted to hear @StriveMasiyiwa say these truths to the world. Zimbabwe deserves a chance to succeed but we can't do this with sanctions standing in the way. As l have said before @edmnangagwa is determined to leave a positive legacy. He needs our support," added Ncube.